Duane Holmes in action for Huddersfield. Derby County have made it nine transfer window signings with the acquisition of Scunthorpe United winger Duane Holmes. Holmes, 23, was a key member of the Scunthorpe side which reached the League One play-offs last season, scoring nine goals and providing five assists. The US-born winger was previously with Huddersfield Town, for whom he played 22 times in the Championship, and had loan spells with Yeovil Town with Bury. In Saturday's opening game of the season against Coventry City, Holmes came off the bench to set up his side's equalising goal. 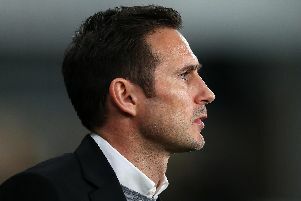 Rams boss Frank Lampard said: "I’m pleased that we’ve been able to conclude the deal to bring Duane to Derby County.